The Vice-Chancellor of the Federal University of Agriculture, Abeokuta (FUNAAB) and President, Association of African Universities (AAU), Professor Olusola Oyewole, has identified the major problems facing higher education in the country. According to him, the five main factors mitigating against the realisation of the country’s virile higher education policies bordered on quality, learning methods, relevance of programmes, access and research quality. 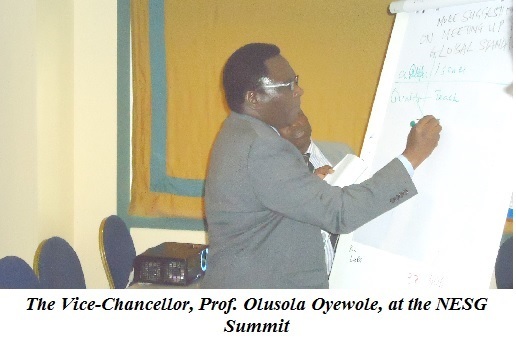 Professor Oyewole disclosed these during his presentation as a resource person at one of the Design Workshops that discussed Tertiary Education, Competiveness and Employability, at the 20th Nigerian Economic Summit, held in Abuja, recently. The Vice-Chancellor stated that if the necessary machinery were put in place to address the five issues, there was going to be remarkable progress in the quality of academic programmes being run by institutions of higher learning. He noted that having coordinated quality assurance in Africa for several years; he had been able to ascertain that there was an urgent need by relevant stakeholders in education to address the key challenges, to attain what was desired. The AAU President charged educational authorities to rather make learning student-based as against the current practice, which he noted was skewed in favour of the teacher (teacher-based), as he also renewed his call for the conversion of polytechnics into Technical Universities, as had been implemented in advanced nations like Germany. When this is done, the problem of disparity of HND/B.Sc dichotomy would have been addressed, among other advantages, he added. Salient points discussed by participants at the Design Workshop IV, which was facilitated by Mrs. Nike De Souza, Managing Director, People Temp Limited, centered on the need to review pedagogy, funding, employability of Nigerian graduates, training and re-training of academics, imperative of redesigning the national policy on education to be more realistic, developing the institution-industry synergy through the setting up of an Industry Advisory Council, inclusion of practically-oriented teaching skill and the imperative of embarking on quality research. Declaring the summit open, President Goodluck Jonathan, represented by the Vice-President, Architect Mohammed Sambo, challenged the Nigerian Economic Summit Group (NESG), to review the policy foundation of Nigeria’s education sector developed in 1969 to meet current realities. The President said: “More than forty years after, this policy foundation is ripe for review, to determine its relevance and fine tune its adaptability to national objectives, in this 21st Century”. The Supervising Minister of Education, Barrister Nyesom Wike, stated that the Federal Government had invested N144.7 billion in basic education between 2009 and 2013. He added the money was given as grants to states to assist them in funding basic education. The minister also said that through TETFund, the sum of N268.484bn was allocated to the Universities of which N233.33billion had been accessed, while the balance of N35.154billion had not been accessed. In addition to the funds released through TETFund, the minister said a total of N94.129billion had been released to Federal Universities, through the National Universities Commission for capital, direct teaching and laboratory cost, and teaching and research equipment. In his address, the Supervising Minister of the National Planning Commission, Alhaji Bashir Yuguda, said the summit would set agenda for “presidential dialogue” on national issues and would go a long way in transforming the nation’s education system. The former World Bank Vice-President for Africa, Dr. Oby Ezekwesili, said focus on early child education wouldthe development ofyoung generation in Nigeria. She called for permanent structural change that would enhance the quality of education and develop skills in Nigerian children. She noted that Nigeria had a lot to do to catch up with global trend. “That catching may be difficult except if it is strategic, the fastest way to do the catching up now is to make early child care education, put it on the front burner of the education system. Countries like Finland had shown clearly that countries that emphasized early child care education and expand access to both the poor and the rich alike make huge success”, she said. Ezekwesili, who is now the Economic Advisor of the Open Society Foundation, said that the best time for formation of a child was between the ages of three and five when the neurons could stimulate well. She said both the public and private sectors should work together in core area of vocational, innovational and institutional building, as this would help to bring the private sector in building skills and capacity of the young ones. “Government has never had a great record in building skills for industry. Education needs intelligent champions. If society fails to bring intelligent champions for inclusion, the intelligent champions themselves will have act in an intelligent way,’’ she said. Ezekwesili, therefore, canvassed need for good governance in the education sector as well as the need to intensify effort in training and re-training of teachers. She called on the government and stakeholders to ensure the employment of qualified hands into the education system. On achieving the Millennium Development Goals on education, she said it was unfortunate that Nigeria was not among the countries that would achieve the goal by 2015, but urged the government to focus seriously on basic education to help build a better society. Earlier, the Director-General of NESG, Frank Nweke (Jnr), in his remarks stated that the decision to hold the summit on education was taken to redress the decline in the sector, being critical to economic development. “The Nigerian education sector is in dire straits and requires the intervention of both public and private stakeholders, if it is to fulfil its function of preparing Nigeria to compete in the global economy,” he said. The Chairman of the Board of NESG, Folusho Phillips also stated that the summit on education would achieve three things: draw the attention of stakeholders to problems in the education sector, consider the capacity of the government in addressing the sector and device institutional mechanisms to address the problems. Phillips underscored the relevance of the summit in fast-tracking theof national policies and called on stakeholders to participate in the change process towards redeeming the education sector for future economic growth. The 3-day summit with the main theme, Transforming Education Through Partnerships for Global Competiveness, which was structured into nine plenary sessions, eight design workshops that touched on all aspects of Nigerian education sector, was attended by the major players. The highpoint of the well-attended summit was a Presidential Policy Dialogue on the education sector, which aims to determine the gaps in the implementation of the Presidential Task Team (PTT) report that is to provide a platform, for meeting Nigeria’s developmental goals. The NESG, which was founded in 1993, is an independent, non-sectarian organisation that is committed to fostering open and continuous dialogue on Nigeria’s economic development by seeking to define and facilitate the implementation of an economic agenda that would help to create a conducive environment to good governance, responsible private sector investment and sustainable private sector-driven economic growth and development. Participants from the Federal University of Agriculture, Abeokuta were Senator/Sir (Dr.) Adeseye Ogunlewe, Pro-Chancellor and Chairman, Governing Council; Professor Olusola Oyewole, Vice-Chancellor and Professor Adekojo Waheed, Deputy Vice-Chancellor (Academic). Other resource persons at the Design Workshop include Professor Femi Bamiro, a former Vice-Chancellor, University of Ibadan; Mr. Solomon Adegbie-Quaynor, Country Manager, International Finance Corporation; Mr. Niyi Yusuf, Managing Director, Accenture Nigeria; Mr. Nicholas Verveide, Managing Director, Nigerian Breweries Plc; Dr. Enase Okonedo, Dean, Lagos Business School and Dr. Aliyu Naiya, Acting Executive Secretary, Tertiary Education Trust Fund (TETFund).